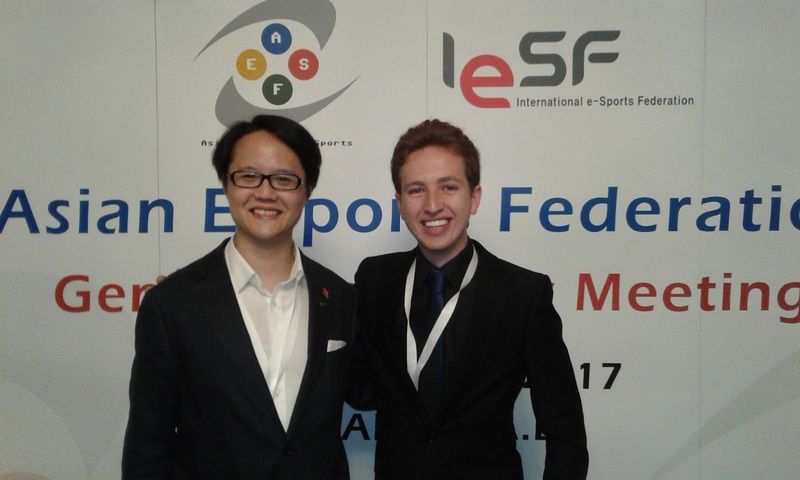 Esports, and other games : Jason Batzofin (IeSF's Athletes' Commission) meets with AeSF's Players' Representative. Jason Batzofin (IeSF's Athletes' Commission) meets with AeSF's Players' Representative. The Asian Electronic Sports Federation's (AeSF) Annual General Meeting held at Hilton Al Ain on 15 September 2017 saw AeSF induct its Player's Representative. Under the watchful eye of His Highness Sheikh Sultan bin Khalifah Al Nahyan, the General Meeting unanimously elected Frederico Alexandre Dos Santos Rosario (of Macau) as its Players' Representative. As soon as he was elected to the position Jason Batzofin (Chairman of IeSFs' Athletes' Commission) welcomed Frederico to his newly elected position. Readers should note that AeSF is without doubt the largest member based continental confederation for esports in the world. In fact, its size of membership is only dwarfed by IeSF itself. Affiliated to International e-Sports Federation, AeSF enjoys the spotlight of being the premier Continental Confederation for esports. There is no doubt that AeSF shall become a major 'mover and skaker' in the world of esports as esports as a fully accredited sporting code continues to grow and develop. Closing date for clubs to bid to host events. The importance of Continental Confederations. Regional Championships - development at its best. "Parting is such sweet sorrow". Time to have your say. Review of SA's test match held against Tunisia. How are National Team Managers appointed? How MSSA applies its funds. MSSA releases latest StarCraft II rankings.